Large village with 2,500 inhabitants next to Szentendre on the Danube. 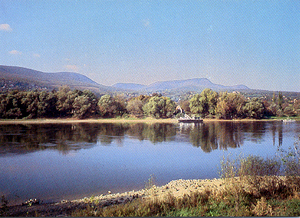 It is the oldest and most popular holiday resort of the Danube Bend. The remains of a Roman watchtower in the centre of the village is a listed monument. Pál Gyulai often spent his holidays here (Szendrey-Gyulai villa) after 1873 and Zsigmond Móricz built a house here from 1911. The exhibition on the activity of the writer, Zsigmond Móricz, can be seen in the Museum of the History of Literature and Local History. In the cultural centre there is a permanent photo exhibition on the famous people who used to live here. Vörös-kő (Red stone) and its environment is a nature conservation area. In summer there are concerts, promenade concerts, temporary exhibitions and several other programmes. 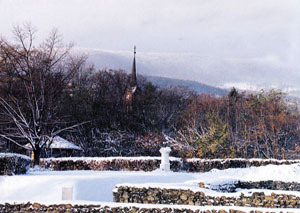 There is also an open-air thermal bath in the village. Its cycling route is one of the most beautiful cycling routes along the Danube. Bio-environment free from industrial plants with excellent accommodation for relaxation. The nearby historical towns (Szentendre, Vác, Visegrád, Esztergom) are within a half hour's ride.